I was recently asked by the guys at The Jack Cast podcast to look at Leon Britton's passing given the fact that he's finally broken his duck with his first assist in the Premier League during the match against Crystal Palace on 2nd March. On looking at the figures I found that this was with his 4,959th pass in the Premier League so obviously not an assist machine, but that's not what he's there for. Over the (almost) 3 seasons Swansea have had in the Premier League so far, Leon has been the fulcrum and has to date played 5,009 passes, completing 4,621 (92.3%). In Swansea's first season in the Premier League (2011/12), Leon had a pass accuracy rate of 93.4% (2,110 completed from 2,558 attempted) which was higher than any other player in the league that season. Under Laudrup this season, the introduction of Cañas along with the occasional injury has meant Leon's influence has been far less, although that may well change under Garry Monk as Leon has played all bar 1 minute of Swansea's 4 league games since the Dane left. Obviously there were plenty of other rumblings of discontent in the Laudrup era, but his decision to play Jordi Amat who is a centre back, in the defensive midfield position against West Ham was maybe the final nail in his coffin. In fairness to Laudrup there was some logic in the plan (extra aerial ability to cope with West Ham's main threat), but Amat switched off from a Carroll knock down for Nolan to score the opener. Football is full of "if-only's" but who knows what would have happened had Leon started, would an experienced midfielder have been instinctively more aware of the threat than a defender playing out of position? Of those 5,009 passes in the league so far, only 1,574 (31.4%) are what were classed as forward passes (14.5% back and 54.1% left/right), this combined with the fact that most of the passes he makes/receives are short passes gives ammunition to anyone who claims what he does is easy but I'd argue that they'd be completely missing the point. Passes made (left) and received (right) in match v Crystal Palace. Most passes only a short distance but his availability to receive a pass crucial to keeping possession ticking over. 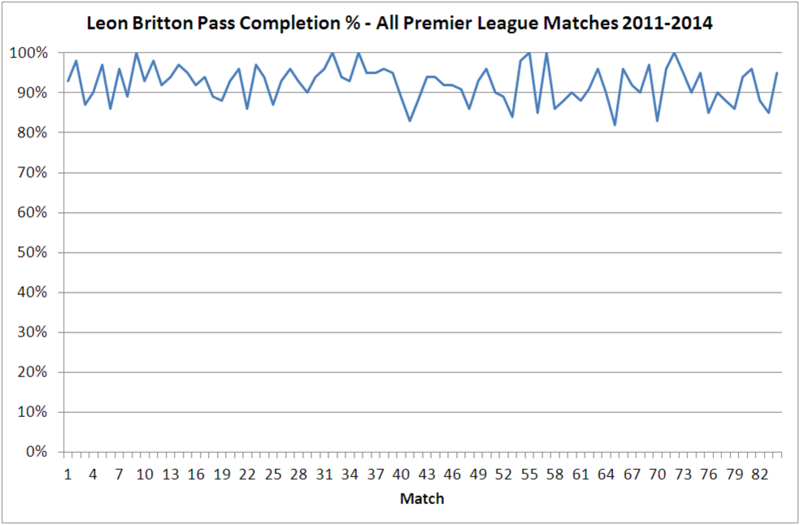 Leon's pass completion % by match - Overall average is 92.3% but not a single game below 80%. In the 84 games played in the Premier League to date, Leon's had 6 100% pass completion games (although 4 of those were as a sub). Season by Season summary for Leon. After being an almost ever present in the first season under Rodgers, Leon was still pretty much a regular in Laudrup's first season but only played in 39% of all game time in the league for Swansea this season under Laudrup but all bar 1 minute of Monk's 4 league games. Leon's strength is in his consistency, decision making and ability to read a game. Sitting in the stands or watching on TV a lot of what Leon does looks straightforward but that's with the benefit of having a wider perspective of what's going on than would be afforded to someone in the thick of it. He's only 5ft 5 inches and not the fastest but is a great example of how there's still room at the highest levels for someone with a real football brain.